Das Konigreich beider Sicilien. Nordliche Halfte: Abruzzo, Terra di Lavoro, Apulien, Calabrien. 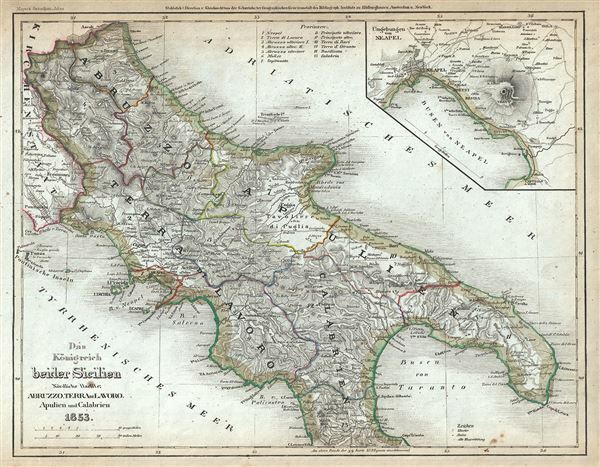 This is a scarce 1853 map of the southern Italy. It covers the northern part of the Kingdom of Naples (a common reference for the 'Kingdom of the Two Sicilies') or Calabria, from Ascoli (Ascoli Piceno) south to Cetraro. An inset in the top right quadrant details Naples and its vicinity. Mount Vesuvius, whose violent eruption in 79 AD buried and destroyed the two cities of Pompeii and Herculaneum, is identified. The map shows extraordinary detail, noting rivers, towns, cities, ruins and other topographical features, with elevation rendered by hachure. The Kingdom of Naples or the Two Sicilies, extending from the Papal States south to include all of Sicily, was the richest and largest Italian state before the Italian unification. Following the defeat of Napoleon and the merging of Sicily and Naples into the Two Sicilies, the Island of Sicily witnessed revolts against the Bourbon rule in 1820 and 1848. The final revolution in 1848 resulted in the island gaining independence from Bourbon control for 16 months. At the same time, revolutionary sentiments favoring the unification of Italy were gaining popularity under Giuseppe Garibaldi, paving the way to Italian solidarity.